Premium-quality micrograin carbide tips are ground on specialized CNC equipment for an extra-fine finish with maximum sharpness and edge retention. 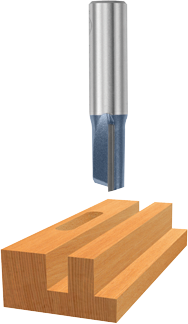 Single flute allows for faster feed rates in softer materials, while carbide tip incorporates the wear resistance of carbide and the toughness of a steel body. The fully hardened and tempered steel shank provides ultimate durability. 85409M 3/8" 1" 1/2" 2-3/4"
85410M 1/4" 1" 1/4" 2-1/4"
85425M 1/2" 3/4" 1/2" 2-3/8"
85264M 1/2" 2" 1/2" 4-1/4"
85279M 3/16" 7/16" 1/4" 2"